Jupiter Donut Factory is one of those places I constantly see on Instagram and pout about not having. After suffering through watching enough people enjoy their glazed goodies, I finally made the trip! One thing that’s awesome about bakeries and donuts is you can try so many options and take more to go. I of course took this opportunity very seriously. Unlike donut shops where I can exclude half of the wall of flavors in the first couple of seconds, Jupiter Donut Factory is a tricky situation because I basically wanted to eat everything. And also get an egg and cheese biscuit. And a coffee. I was warned that JDF sells out on big days and with certain flavors, so I didn’t take any chances. I called ahead to reserve a cronut and make sure I’d have some options. I was not disappointed! I am a Boston Cream girl, so that was the first one in the box. It didn’t make it to the door. Then I added in a Blueberry (that’s a fruit serving, right? ), Chocolate Frosted with Sprinkles and Cookies and Cream for some chocolate-y goodness, a Glazed, Heath Bar, and Samoa (Girl Scout inspired? Yes, please!). I could have ordered for 20 minutes… Smore, Snickers, Red Velvet, etc… it could have gotten really bad. If you are a Krispy Kreme kind of donut lover, this may not be the place for you. If you are a DD’er, I think it’s more your style. The donuts are big and beautiful and delicious. And if you pick a flavor that can be covered in toppings, it is. JDF serves Oceana Coffee, so that was a no-brainer and then I was happy to see my friend order an Egg & Cheese Biscuit which I had also been eyeing. I like how there are some savory options. I did get a Cronut. I have yet to experience the original so I won’t try to act like a cronut snob as I think it’s a term used pretty loosely (I’ve had a few and none have been similar or even the same shape). If you’re a die-hard, you may not like this one but I thought it was pretty tasty and would definitely go back for more. It was like a glazed croissant and light and flaky inside which I liked. 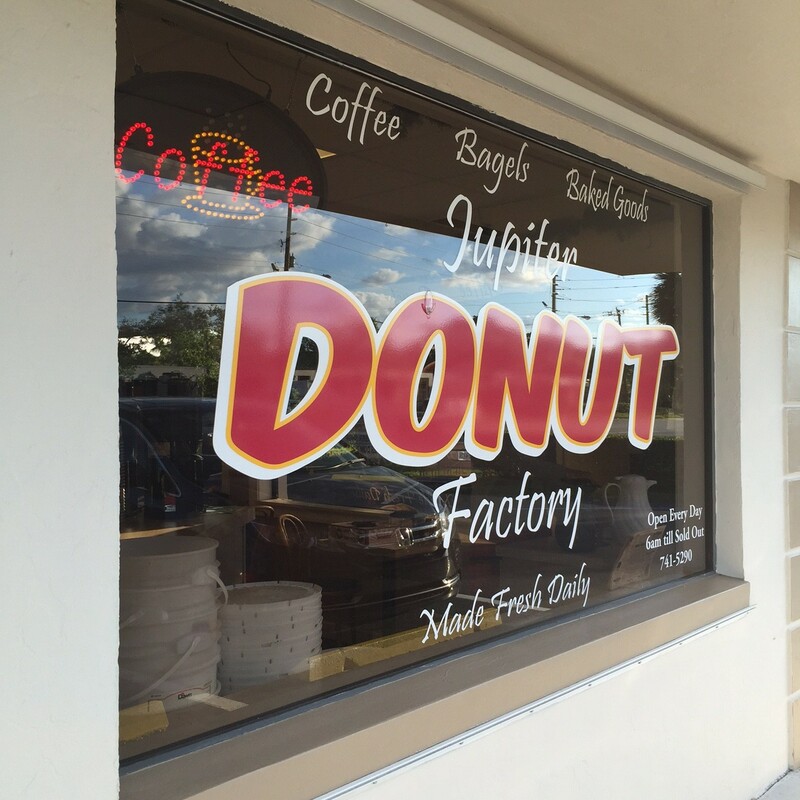 Jupiter Donut Factory is a local favorite and rightfully so. All of their packaging says “You deserve a donut.” which is a statement I can stand behind. They recently opened up a Royal Palm Beach location for those looking to partake further south. If you haven’t been, make the trip. Or convince a co-worker to bring in a dozen if you’re lazy. It’s a great family-run business offering up some seriously yummy treats.